Post-traumatic stress disorders – PTSD symptoms. Post-traumatic stress disorder (PTSD) is a serious mental disorder. More than 5.6% of people worldwide develop PTSD at least once in their lives. PTSD symptoms have a disruptive effect in regards to social and occupational functioning; some people are unable to go to work, attend social events and/or talk about certain topics because they are reminded of a traumatic event. 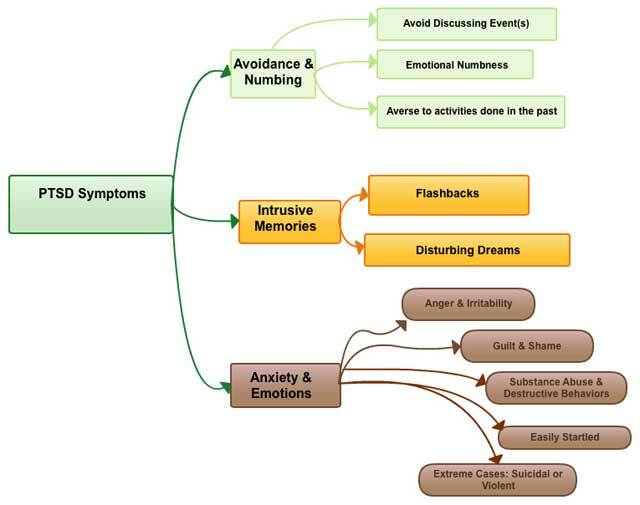 Common PTSD symptoms are flashbacks, nightmares, loss of interest, feeling numb, and sleeping problems. The symptoms may be very severe or mildly present. Sometimes PTSD symptoms suddenly pop-up and can make someone dysfunctional for a while, especially after being reminded of the traumatic event. ‘Innocent’ objects, topics or gestures may be triggers for those who experienced a traumatic event. This page discusses the DSM V PTSD symptoms that develop after experiencing a traumatic event and explains how these symptoms can affect a person. At Barends Psychology Practice, we treat Post-traumatic stress disorder online and in person. Schedule your first, free of charge session here. (Depending on your health insurance, treatment may be reimbursed). What are the post-traumatic stress disorder symptoms? What are the PTSD symptoms? Post-traumatic stress disorder symptoms can have a disruptive effect on peoples daily functioning. The reminders of a traumatic event may cause someone to socially withdraw, avoid certain places, and problems sleeping. These symptoms typically develop after experiencing a traumatic or stressful event: a life threatening event, (threatened) sexual violence or (threatened) serious injury. In case you are interested in your PTSD score, please fill out the online PTSD checklist and gain some insight. Alternatively, you can make an appointment to start (online) PTSD treatment. PTSD symptoms do not always start soon after the traumatic event. Sometimes it takes a few months or even years before someone experiences the first symptoms. Some PTSD symptoms arise suddenly, whereas others arise more gradually. Some symptoms will stay for a long time, while others come and go over time. Sometimes symptoms are triggered only by a certain smell, visiting a certain place or by meeting with certain people. If your PTSD symptoms last for at least four weeks, affect your work and daily activities in a negative way and causes great distress, you may have PTSD. If you think you are suffering from the symptoms of PTSD, and have been for a long time: don’t lose hope. Many people come to live with their PTSD symptoms and feel it is too late for them to recover, but it isn’t. PTSD treatment is effective for those suffering from a recent trauma to trauma’s that occurred 20 years ago. It is never too late to get help and get better. Post-traumatic stress disorder symptoms – simplified. Avoiding places, people, situations, feelings, activities and thoughts that remind you of the trauma. Think of avoiding going out at night if you were robbed at night. Loss of interest in life in general and activities. Sometimes someone may experience feelings of emptiness and may not understand why they do certain things. Feeling (emotionally) detached and numb. The inability to experience the emotions and feelings you used to experience in certain situations. Inability to remember important trauma related information. It is possible that someone has selective amnesia and can’t remember what exactly happened. This could be just a few minutes or longer periods of time. Difficulty picturing your future. (Difficulty picturing yourself getting married or have a career). Intrusive, upsetting memories of the traumatic event. These memories often come unwanted and are difficult to stop. Nightmares (about the traumatic event or of other frightening things). Flashbacks (re-experiencing the traumatic event). Intense distress when thinking of the traumatic event. Significant physical sensations to reminders of the traumatic event. (Physical sensations such as increase heartbeat, nausea, sweating, muscle tension and rapid breathing). Irritability or outbursts of anger. Someone may respond out of character or out of proportion to the situation. Difficulty concentrating (on tasks). Sometimes someone keeps having flashbacks or distressing thoughts about the traumatic event, but complete numbness is also possible. Sleeping problems (difficulty falling asleep or staying asleep). Hyper-vigilance (being overly alert to everything). Responding out of character to certain situations. For the full diagnostic criteria of PTSD, please click here.